This is the “Cadillac” of the Vince Miller plans. 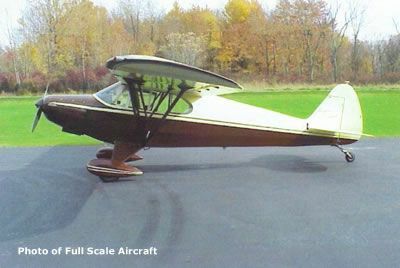 The PA-12 Super Cruiser is the three-place Cub. Think of it as a PA-18 with a two-place rear seat. Some folks refer to this plane as the “Fat” Super Cub, however this is misleading. This is a nice looking plane and will stand out at the flying field. The real plane was painted in Tennessee Red and Cream and will stand out from other Pipers. The plans show a Fox 78RC engine but also suggest a ST-91 RC, or Enya 120 four-stroke or OS 120 four stroke. Construction is all balsa and ply. Scale fidelity is good to excellent with lots of scale details shown, including a working cockpit door. The wing uses a USA 35 B airfoil with a slight under-camber.